Our range of products include disposable medical apron for hospital industry. 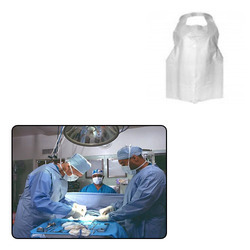 Capitalizing on our vast industrial experience, we offer wide array of Disposable Medical Apron for Hospital Industry that are used to protect from the chemical splashes. They also protect the dresses and prevent them from spoiling. We offer them in standard sizes and are available with adjustable strap to adjust according the preference.